Restriction of water entry into underlying pavement base and sub-grade layers serves to maintain pavement strength and prolong pavement life. Pavements in different climate zones, with different construction types, and with different traffic loadings experience different types of cracking. The various crack types experience different movement ranges depending mostly on crack spacing and temperature variations. Different types of crack treatment materials and installation geometries are required for the different conditions. There are several types of materials used for crack treatments ranging from unmodified asphalts and emulsions, to polymer and rubber modified asphalts and specialty chemically curing polymeric materials. Hot applied rubber and polymer modified asphalts are the most widely used materials. Crack treatment materials must have appropriate properties for the climate in which they are used and need to be able to accommodate expected movement. Proper materials are available for use in all climatic areas. Crack treatment materials can be installed in a range of configurations and with varying preparation methods. Configurations range from filling unprepared cracks and capping with a narrow overband, to specifically designed reservoirs that widen the crack to provide the correct geometry for the expected movements. 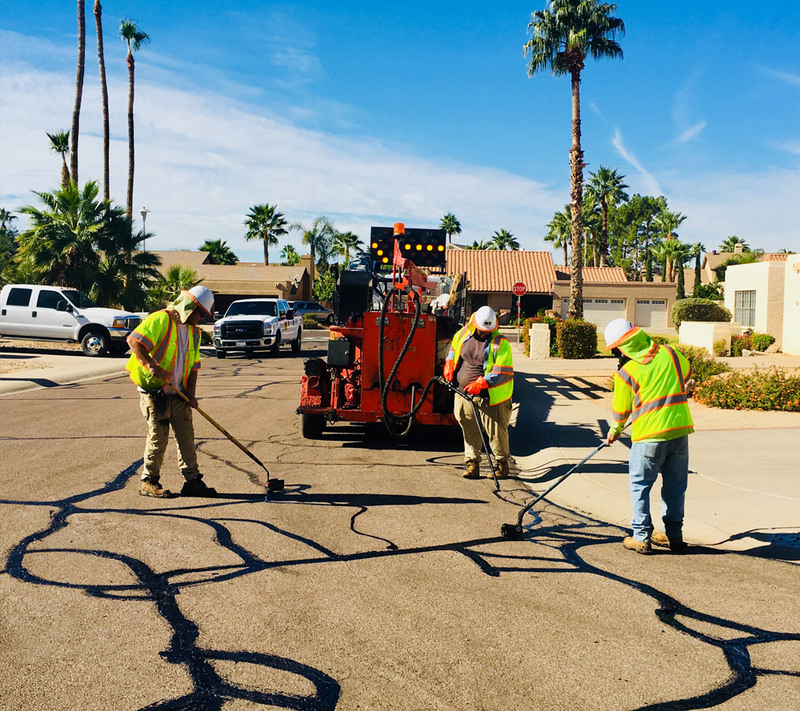 Crack Filling— Filling treatments are used for pavements that primarily have non-working cracks (less than1/8 inch annual movement). Filling treatments generally consist of cleaning the cracks and placement of appropriate material in a fill and slight overband application. Filling treatments are generally used for cracks spaced at less than 20 feet for block, random closely spaced thermal, and longitudinal cracking. 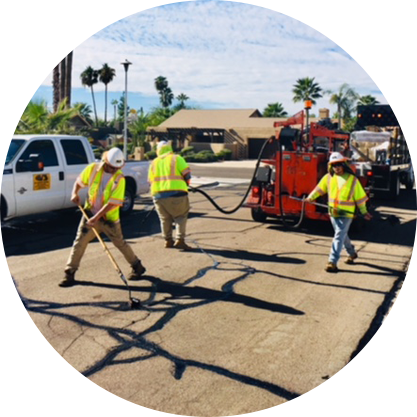 Crack Sealing-— Crack sealing treatments are used for pavements that primarily have working cracks (greater than 1/8 inch annual movement). Sealing treatments consist of creating a widened reservoir to provide proper geometry and placement of flexible, extensible material that can accommodate the expected movements. Sealing treatments are generally used for thermal cracking spaced at over 20 feet. For all sealing or filling installations, the treatment material needs to have appropriate properties for the specific temperature ranges at the project site. 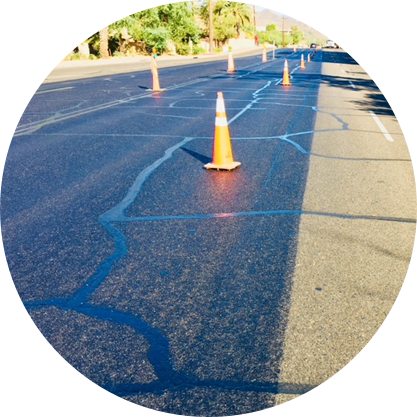 Wide Crack Remediation-— Untreated pavement cracks tend to grow in width causing a drop in the pavement functional and structural integrity. In Arizona and other western climates a particular type of this distress involves the development of cracks as wide as six inches, which pose problems for traditional remediation techniques. A recent solution is applied Repair Mastic. This product is a hot-applied, prepackaged, ready to melt mastic repair material made from quality-selected asphalt, hard/durable aggregates, and a combination of additives. Benefits compared to patching are less labor intensity and overall costs, and restore structural integrity. HOW ARE CRACK TREATMENT MATERIALS APPLIED? Application consists of 3 basic steps– cleaning the cracks, cutting the reservoir if needed, and installing the material. Cleaning is generally accomplished using compressed air. Reservoir cutting is performed using a crack saw or router that can cut varying widths and depths as required. Hot applied products heated to the appropriate temperature in a melter unit equipped with agitation and a temperature monitoring device. The heated material is then pumped into the crack or placed using pour pots or wheeled applicators. Cold applied materials can be installed using pour pots, or other containers. For all installations, cracks must be clean and dry for the best performance. HOW LONG DO CRACK TREATMENTS LAST? Properly designed and installed crack treatments have been proven to last between 5 and 7 years. HOW LONG DO CRACK TREATMENTS EXTEND PAVEMENT LIFE? Properly designed and installed crack treatments have been proven to increase pavement life up to 7 years.